You will always get a friendly welcome at our office. When you arrive at our office you’ll be welcomed with a friendly smile. You’ll soon discover that Dr. Feryal Alidadi is a very caring and gentle dentist who is experienced, efficient and understanding. She’s easy to talk with and very patient. She listens to your concerns, explains her diagnostic procedures, answers your questions and does whatever it takes to put you at ease during your visit. Dr. Alidadi performs a thorough new patient exam. Dr. Alidadi provides extremely thorough dental exams for new patients. She has over 20 years of experience caring for her patient’s smiles. She stays up-to-date on all of the latest advances in dental technology and procedures by attending on-going continuing education courses at top-tier dental learning institutions. Her focus is on personalized care and comprehensive, efficient service. Dr. Alidadi wants to know all about her new patients and what she and her team can do to transform first-time visitors into returning patients. An exam is the ideal way for her to get to know you and your unique oral health requirements. Dr. Alidadi will conduct your exam and then create a personalized treatment plan that includes regular dental cleanings that are customized to your particular needs. Our friendly, caring staff will do whatever it takes to make you feel comfortable and relaxed throughout your visit. Dr. Alidadi’s comprehensive new patient exam may be the most complete dental exam you’ll ever receive. 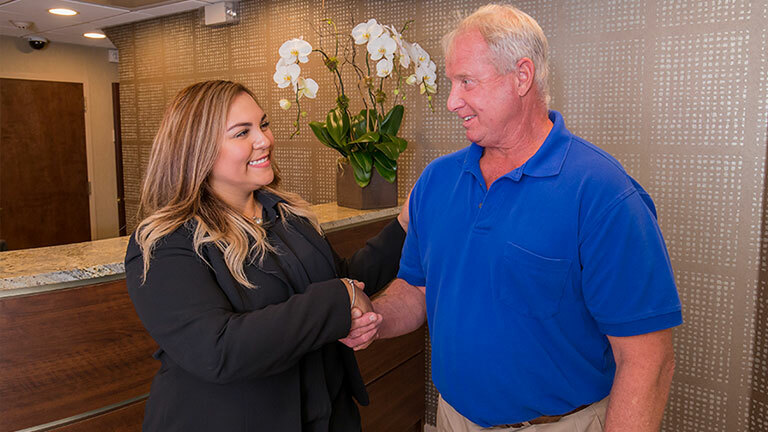 The first step is to discuss your smile goals with Dr. Alidadi in a private consultation. She’ll get to know you and go over your health and dental history, discuss any concerns you may have and answer all of your questions. During the exam Dr. Alidadi will evaluate the health of your teeth. 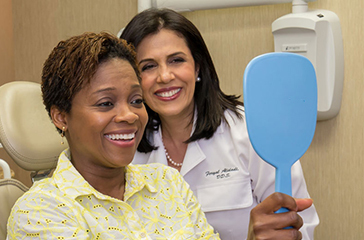 She will check your bite, any fillings, crowns or bridges you have as well as your gums to get an overall picture of the state of your oral health. Next, we’ll take digital X-rays and digital photos of the inside of your mouth. After diagnostics are completed, Dr. Alidadi will recommend a customized treatment plan to improve your oral health and the aesthetics of your smile. We will educate you on proper dental health. Maintaining a regular dental check up schedule will ensure that any small dental problems are identified and treated before they can turn into larger and more serious problems. We recommend coming in every six months for a cleaning and checkup, as long as you aren’t experiencing any pain or discomfort around your teeth, gums or jaw. If you are, then make an appointment to come in right away. With frequent, regular checkups, Dr. Alidadi can check for early signs of tooth decay, gum disease, TMJ (jaw joint) dysfunction and other problems. We take digital X-rays, which use less radiation and provide sharper images than conventional X-rays. 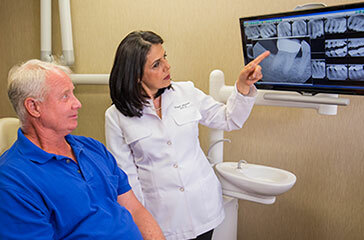 In addition to digital X-rays, Dr. Alidadi takes photos of the inside of your mouth with an intraoral camera. She is able to see instant images of your teeth and gums on her monitor and can show you exactly what she sees. The DIAGNOdent system utilizes a precise laser device to scan for hidden cavities. If tooth decay is present, it will glow. The laser scans areas of your teeth that traditional instruments cannot reach. Laser scanning enables the doctor to identify tooth decay in its early stages, before the tooth needs more extensive procedures. Dr. Alidadi will go over your X-rays with you. Gum disease is the primary cause of tooth loss. 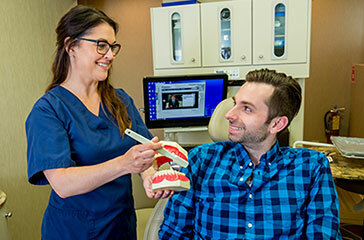 With a periodontal exam and charting, Dr. Alidadi will determine how healthy your gums are, and if gum disease is present, what the best treatment option is. When the jaw joint (temporomandibular joint, or TMJ) is not aligned properly, it results in pain, headaches and clicking or popping sounds when the mouth is opened and closed. This can result in problems eating and can cause excess wear on the teeth. Dr. Alidadi checks your TMJ for proper alignment. Dr. Alidadi performs a visual oral cancer exam as part of the new patient exam, and as part of maintenance checkups. An oral cancer screening can detect a small problem before it has a chance to develop into a larger one. Dr. Alidadi uses only tooth-colored fillings. We use tooth-colored composite fillings instead of traditional amalgam (metal) fillings. Not only are these more aesthetic, they are also healthier for your body than amalgam fillings. If an injection is needed prior to the procedure, Dr. Alidadi has a very gentle touch and reassuring manner, to put you at ease. In many cases Dr. Alidadi can use her dental laser rather than a drill to prepare the tooth for a filling, often making anesthesia unnecessary. Many oral health problems go undetected, as they don’t cause any pain or discomfort until they’ve become very serious. Regular cleanings and checkups – at least once every six months – will help you avoid serious oral health issues in the future.